Today is a day that I will never forget. It's difficult to put words to the fulfillment and joy we experienced while serving at the national girls (ages 13-18) prison. The Sus Hijos staff did their best to prepare me for the day. I learned that all of the girls in this facility are involved in gangs. The inmates are separated in sectors by their gang affiliations and needless to say, they each have heart wrenching stories. When we entered the prison we were frisked and asked to leave our ID's and personal belongings with the guards. To be honest, I was a little nervous. I had no idea what to expect as I entered the run down facility, but the presence of the Lord was strong. My gang member stereotypes quickly dissipated as I met the girls. They were sweet, friendly and generously offered me warm embraces. As I began to share my testimony and purpose for coming, I was moved by how they responded through their smiles and even tears. We talked about the fact that brokenness exists in every part of the world, whether in gangs, terrorism, famine, poverty or even affluence. I shared how Jesus filled the holes in my heart as a teen and asked them to consider what's filling the holes in their hearts today. We discussed the humility, gentleness and servant-heart of Jesus. There is nothing else as powerful and transforming as the Gospel of Jesus. I challenged them between the difference of joining a gang (which requires criminal activity) and "joining" Jesus (becoming a servant). We read through John 13 and discussed how the King of Kings chose to wash his disciples' flithy, dust covered feet. When they realized that we were preparing to wash their feet, they began to giggle and squirm. Suddenly they became nervous and I was completely at peace. Many refused to have their feet washed at first. However, we felt the strong presence of the Holy Spirit as we began to cleanse and caress their feet. The director began to play worship music and a peace came over the room. One by one they allowed us to wash them. One girl even asked to be washed a second time. 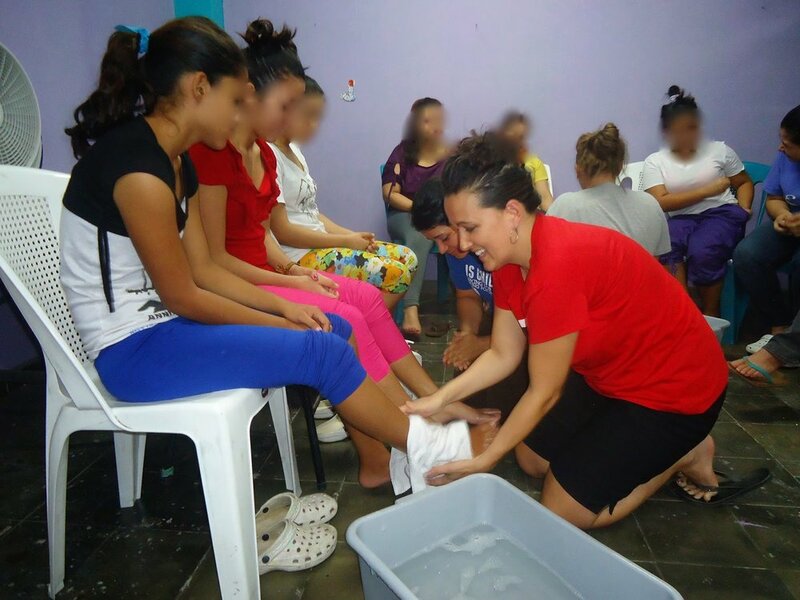 The act of cleaning their feet was a powerful reminder of how Jesus can cleanse our hearts and make us new. We closed our time arm in arm, huddled in prayer, thanking him for forgiveness, hope and new life. The girls also had the opportunity to write out prayer requests. We prayed over their requests this evening and laid their burdens at the feet of Jesus. "I only want to give you thanks for this and say many blessings and that God will bless you." As the girls left the room today, they thanked and embraced us. I gazed into their eyes and saw glimpses of hope. Please pray for these young ladies, who have many battles ahead with court dates, family issues and challenges unfathomable to those of us living in the First World. Pray that they will always remember the cleansing power of the Cross and choose Him over darkness.